Within 24 hours of returning from UAE visit, Prime Minister Narendra Modi attended function in Bihar where assembly elections would take place in next couple of months. 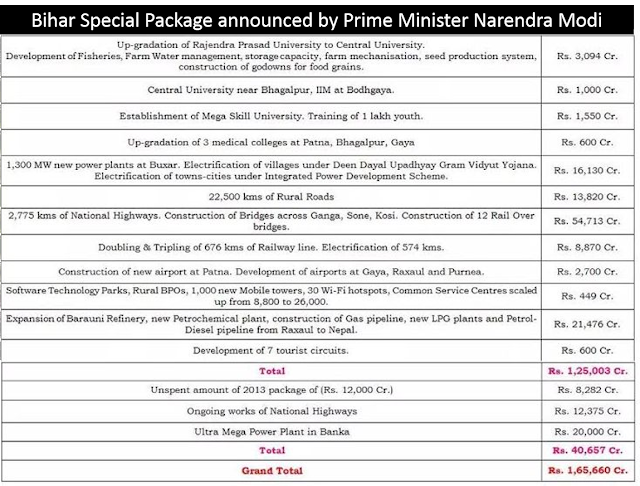 In line with his government policy of “Develop East”, special package was announced worth ₹1.25 Lakh Crore. This is additional to already pledged funds by Central Government of ₹40,657cr for ongoing works of highways and power projects. Additionally, unused amount ₹8,500cr by Bihar state government from Centre’s last package is not included. In Bihar, BJP led NDA is fighting with JDU-RJD alliance of Nitish Kumar and Lalu Prasad Yadav while other parities such as Congress are minor partners. Traditionally, caste based politics plays vital role in Bihar election. However, with such massive financial package declared by Narendra Modi the “Development” issue could become central point during polls. In 2014 Lok Sabha elections, NDA won 31 out of 40 seats while JDU could manage only 2 while RJS won 6.